March is a month that matters for many reasons. For many it is a time of assessing, writing report cards, arranging parent-teacher conferences, and organizing open school week. It is one of the longest months with 22 schools days without even a single three-day weekend. But March is also one of the most fulfilling months because this is the time of year we begin to see our young students flower. They seem to grow overnight. Not only are they taller, but things seem to start clicking and all your efforts finally seem to be paying off. With this new maturity comes new expectations, both for our children and for our charts. March matters. Charts make our teaching visible, but how can we make sure our charts grow and change across the year as our children grow and change? A recent workshop on Webb’s Depth of Knowledge (DOK) presented by the brilliant Janet Steinberg got us thinking about ways we can grow our charts, extend their usage, and deepen the level of teaching and learning. In a nutshell, the four levels are: 1. Recall, name & define. 2. Notice, describe, & explain. 3. Apply, analyze & evaluate. 4. Synthesize, reflect & modify. Let’s take a closer look at how this might play out when it comes to charts. A typical chart found in the classroom is a list of strategies. For example, a list of things to include in a persuasive review. 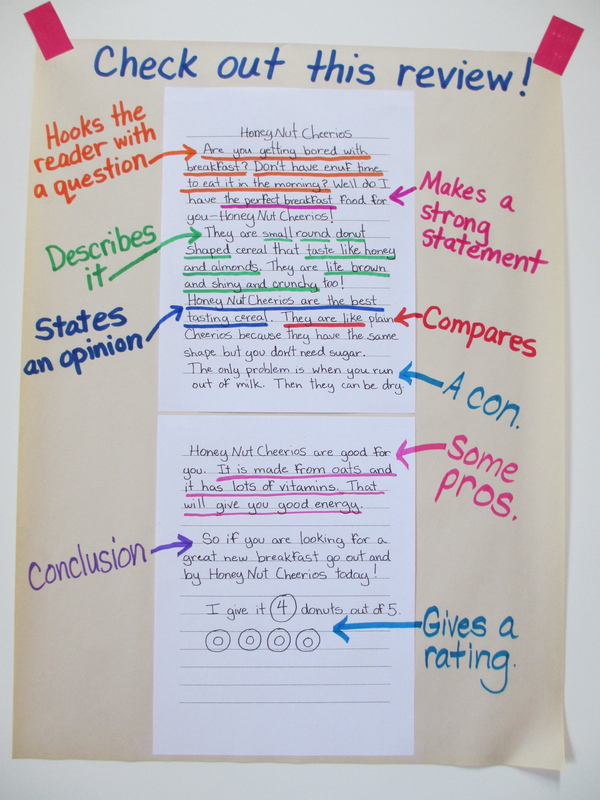 The chart below names things reviews often have and the children are expected to use the chart to remember these points when they write their own reviews. The chart tells them what to do. These characteristics make this type of chart a DOK level one. This chart gives a big picture overview of what a “rave review” often includes. This is the chart under the poster used to launch the unit. "Critics review things that are interesting & memorable." One way to make this chart a DOK level two is to add in the why and the how. We don’t just say it and name it, we show the steps or how to do it. 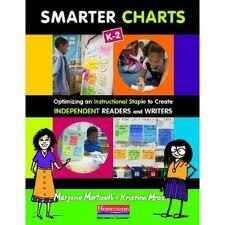 Many charts found in classrooms are procedural charts. You can see in the example below how the chart is growing and becoming more specific as the review unit proceeded. 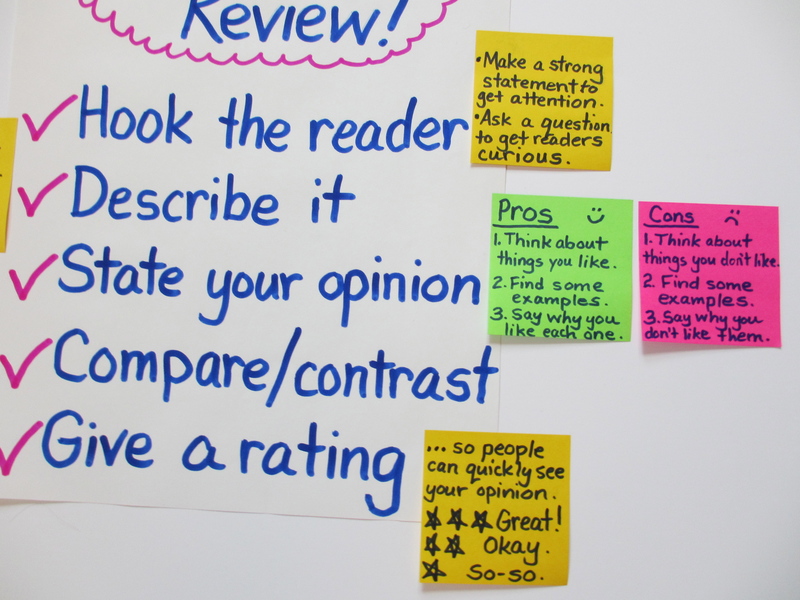 So next to the statement, “Hook the reader,” the teacher has added two ways to hook the reader and why they might work. One is, “Make a strong statement to get attention,” and the other is “Ask a question to get readers curious.” The “Describe it” statement is elaborated by reminding children of what they know from previous units, to use one’s senses when describing something. “State your opinion” is broken down into “Pros” and “Cons” and both have steps for coming up with pros and cons. For example, under “Pros” it lists the steps as: 1. Think about things you like. 2. Find some examples. 3. Say why you like each one. Compare and contrast is similarly broken down into steps. On the original chart there was no mention of either why a writer would do these things, nor how to do them. The final bullet tells the student to “Give a rating.” The revision includes the why…so people can quickly see your opinion, and an example showing three stars for great, two stars for okay, and one star for so-so. This chart is growing as the teacher adds in the why and breaks down each part into steps. This is a close up of the large post its containing the why and the how that were added to the original review chart. 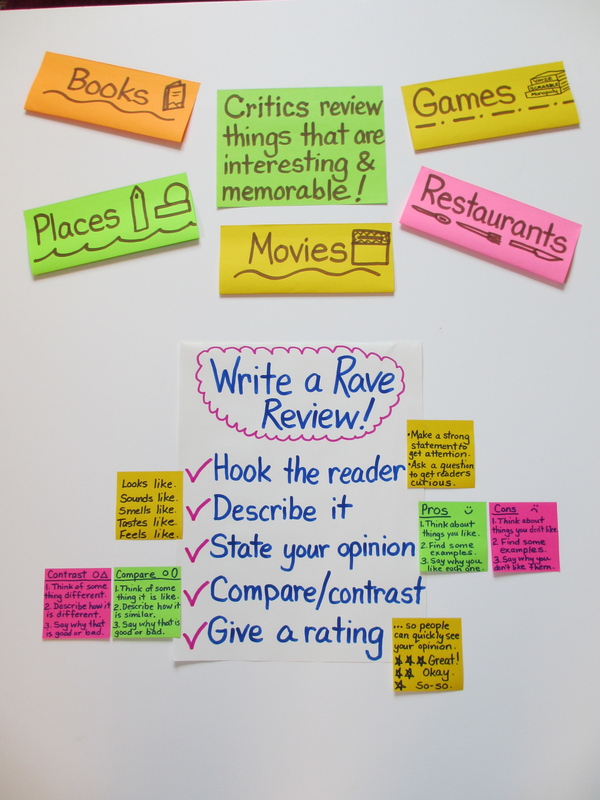 This is another close-up of the post-its added to the chart with the why and the how. Wondering how this chart could get any better? 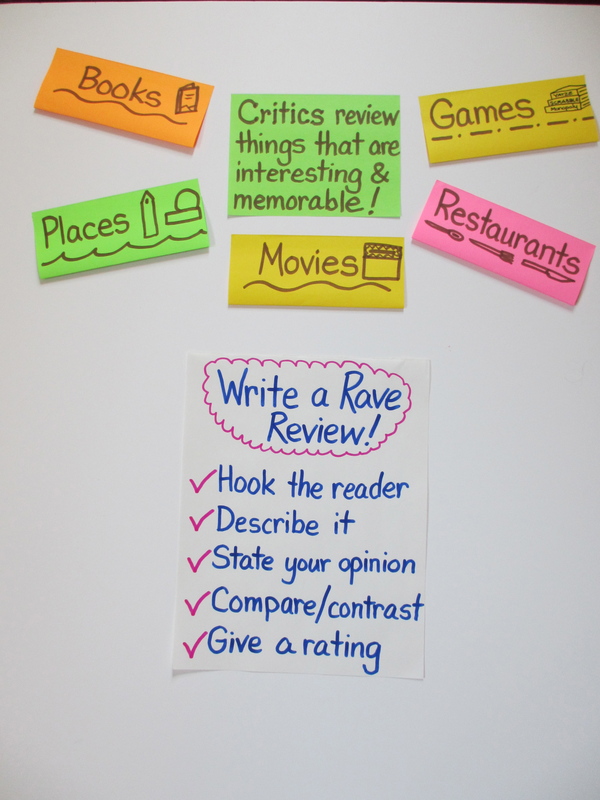 Try adding a kid’s example and ask the child to discuss what she has done to write her review. Then annotate all the ways the child is using what has been taught. The chart below shows a photo copy of one child’s review with the annotations created during one such discussion. The descriptors come from the chart above and each one is color coded to make each craft move distinct and clear and a model for others to use when writing their reviews. Ultimately, it is the discussion, the explanation, and the giving of reasons that encourages deeper thinking and understanding that leads to a DOK level three. This is a photocopy of a child's review that has been marked up and names all the child did as a review writer. Our charts contain all that we have modeled and demonstrated and help remind children of what we have taught as they practice on many pieces over many days. But our charts are strengthened when we have many discussions about what is on them, what is added to them, and what is deleted from them. 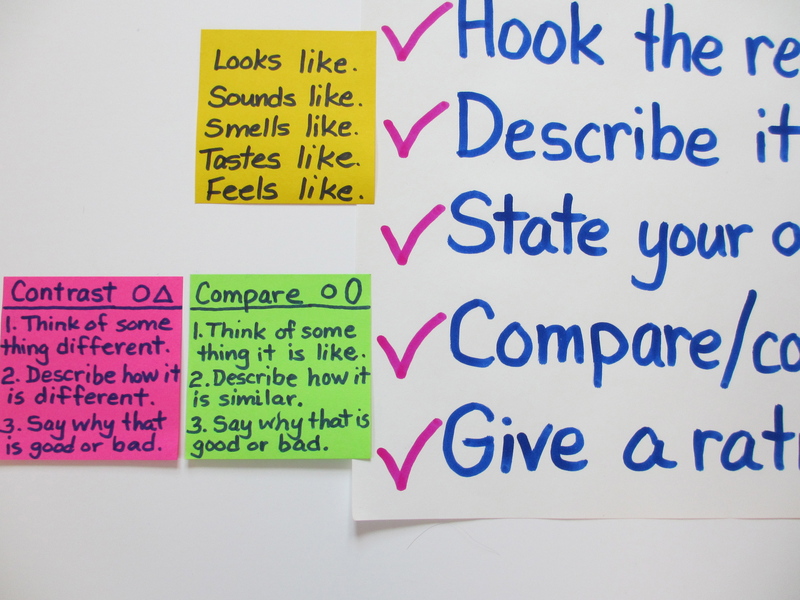 To further grow the purpose and use of these charts in a way that moves them towards a DOK level four, would be to have children to use them to reflect on their own writing, to mark up their own writing in a similar way as the example above shows, and to encourage them to take risks, make modifications, try something new, and even create their own charts that are customized to their needs and desires. They could also extend what they have learned during this review unit to social studies, science, reading, and mathematics, thinking about hooks, opinions, pros and cons, to just name a few. We would like to thank Janet for pushing our thinking, along with Natalie Louis and Mary Ann Colbert who always ask the most thought provoking questions. We never cease to be amazed by what there is still to learn about classroom charts and we love that we are learning, not only alongside you, but from you as well. Keep sending us your ideas, your questions, and pictures of your charts.